In 1943, World War II was raging. No one could predict how much longer it would last, so the military began making plans to shore up its ranks of officers. Those officers would be needed as leaders in combat. 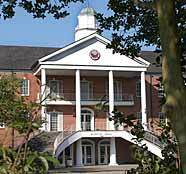 UL Lafayette was one of about 130 universities across the nation chosen for the V-12 and V-5 Navy College Training Programs, which were designed to prepare Navy and Marine officers. Recruits took college classes and trained in basic military customs and procedures. In short order, military uniforms were common attire on campus as recruits from all over the country poured into Lafayette. Program participants boosted the local economy by spending their pay at nearby businesses and they also encouraged patriotism by assisting with U.S. Savings Bond drives. In the sports arena, they helped produce an undefeated football team that included many All-American players and a basketball team that won 11 of its 13 games in 1944. The program ended in 1945 but the spirit of the V-12 and V-5 participants have never been forgotten. Starting Oct. 1 and continuing until Oct. 6, participants from the V-12 and V-5 programs will be on campus for a 60th anniversary reunion. The schedule of events includes an optional tour of the D-Day Museum in New Orleans, a tour of the UL Lafayette campus and a visit to Germanfest in Robert’s Cove. A reunion celebration is set for Oct. 4 from 6 to 10:30 p.m. at the Holidome. A breakfast and business meeting will be held the following morning from 7:30 to 9 a.m. also at the Holidome. For more information about the reunion, contact the Alumni Association at 482-0900.